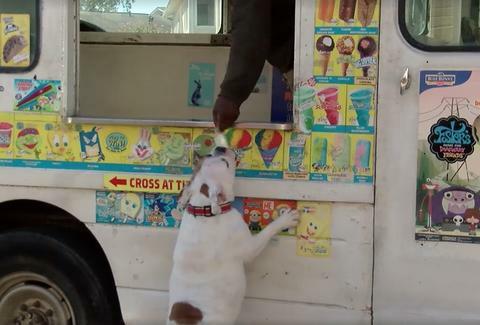 Those incessant, ice-cream-truck-powered jingles may have quieted down for the season, but that’s not stopping Rambo -- Huntsville, Alabama’s most loyal customer -- from chasing down his local ice cream truck, day after day. Truly, sometimes a cliche comes to life in the most amazing way. The two-year-old English bulldog might not be able to clear the truck’s counter, order for himself, or hold his frosty treat, but what can we say? The little dude just loves him a popsicle. "He's like, 'Give me my ice cream, my dad will pay you,’' owner Ashish Silwal told Alabama ABC News affiliate WAAY 31. Apparently the ice cream man also gets a kick out of this demanding repeat customer, and readies himself with the pop as soon as he hears Rambo panting down the sidewalk. "This dog always gets ice cream from me while the owner is watching,” Akins Luwoye, the truck’s driver, said. “Other dogs on my route, when they hear the music, they're scared. But he is not scared, so it's unique." Meredith Heil is a staff writer for Thrillist. She's got a snow cone in her paw and Rambo at home. No more collar 'round her dome. Get at @mereditto.